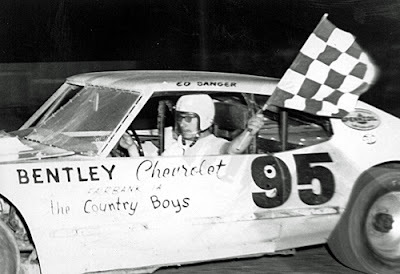 Waterloo, Iowa (July 11, 1976) - Ed Sanger bolted out ahead of Bill Zwanziger on the first lap and went on to win Sunday night’s mid-season late model stock car championship at Tunis Speedway. “That early lead is what won it for me,” said Sanger, who had just captured his fifth feature in a week and also his fifth Tunis main event, triumph of the season. Sanger, the second-leading Tunis late model point-getter going into the evening, started on the outside front row with top point driver Bill Zwanziger on the inside. Sanger came out with about a three car length lead on the first backstretch about the same margin he had over runner-up Zwanziger when the 35-lap event ended. Curt Hansen, who started third, finished in that position. Karl Sanger topped Tom Bartholomew in a hard-fought battle for fourth position. Red Dralle, driving Denny Osborn’s car, placed sixth. Osborn has an injured hand. Sunday’s win climaxed a $4,000-plus week Sanger indicated. He started it off last Monday night with an $800 feature win at Tunis and followed with victories at Oskaloosa on Wednesday, Lake Superior, Wis., on Thursday, Cedar Rapids on Friday and a second place finish to Hansen on Saturday at Eldon. John Weers scored a relatively easy sportsmen mid-season title win while Gary Ekuall was declared the roadrunner champion in an accident-shortened race.